While I think we’ll be doing most of our hanging out in the basement, we also have a living area on the first level. There are a few places in the house that feel a little small to me and the dining room is one of them. One the right side you can see the entrance into the kitchen and on the left is the door that leads up to the master bedroom. 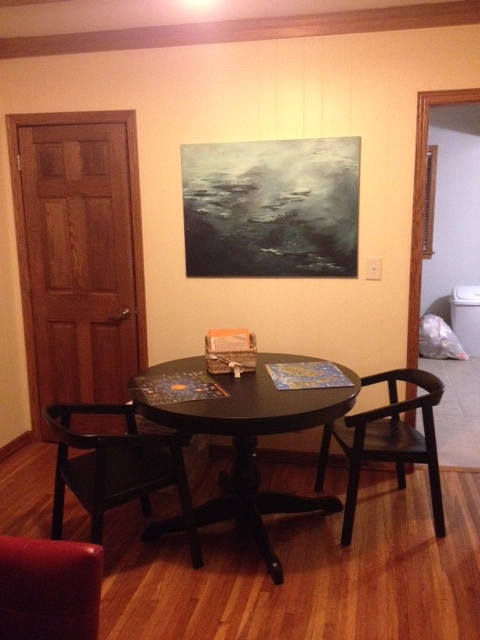 We currently only have two chairs for the table but we’ll need relatively narrow ones to fit the space. On the wall is a painting a friend made for me. I asked for something that would convey the feeling of being underwater, which I think it does. It makes me feel peaceful. We’ve never had it on the wall before so it feels nice to finally be able to put it up. The dining room leads into the living room below. I love the floors in here and the beams on the ceiling. 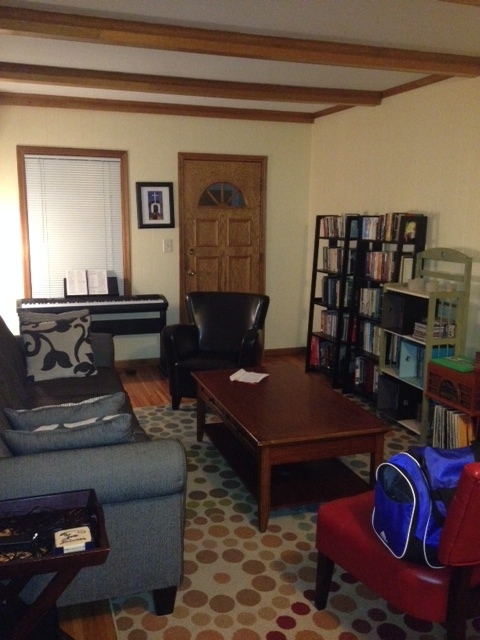 We’re also able to fit six of our nine bookshelves (we…might have a book problem) in here, which is excellent. The door leads out to our three season porch, which I adore. At some point I think I might like us to paint this room a bit more of a vibrant color (my heart longs for orange, but that might be overwhelming for the space) but the very pale yellow/off white works fine for right now. All of the furniture in this room is from the old house, so this was a cheap and easy room to put together. The only big change was that we took the padded child proofing safety covers off the corners of the coffee table. So, watch yourself, kids. It is open season on head injuries if you keep failing to use walking feet, damn it. I think I’d like to hang one or two more pictures, but this space is basically done.